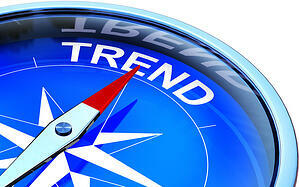 The inbound marketing world is growing rapidly, is constantly changing and is without a doubt the future of marketing. Staying up to date with current trends is essential in ensuring you’re taking advantage of everything inbound marketing has to offer your brand. But with an ever-evolving industry, it can feel hard to keep up. Today we want to break down a few of our favorites that you should be paying attention to as an inbound marketer. 1. Increase in mobile web browsing. During 2014, mobile web browsing is expected to exceed desktop and laptop browsing and become the primary source for viewing the Internet. This is huge because although people are still viewing your web content, they are viewing it in a very different way. Not only is it now more important than ever to have dynamic, eye-catching content to attract the web browser on the go, but it is becoming vital to have a website that utilizes responsive web design techniques. Responsive design allows your site to be optimized differently depending on the platform it’s being viewed on, and as a result it’s ranked higher in Google searches done on a mobile phone. If you have your phone handy try this out: open your mobile browser and search something...anything at all. Now open up the first few sites they recommend. Are they all mobile friendly versions? They should be! As inbound marketers we are focused on a form of marketing that is not interruptive and we are doing this by personalizing the content and aligning it with your interests. Our marketing focus has shifted from brand pushing to having a conversation and we are doing this in several ways. We are taking advantage of social media networks to post not only content about ourselves, but also share relevant content others have posted. By really knowing our buyer persona we can help them answer specific questions they have and solve problems that may be plaguing them. Through these networks we can engage easier and develop personalized relationships with potential leads. Not only does this appeal to the viewer but it also makes it easier for us to get immediate feedback. We are revamping our websites to allow you to access the exact type of content you are looking for without digging through a bunch of irrelevant information. Email personalization is also important because it gives your message a fighting chance among all the other mail in your inbox. We are segmenting our mailing lists and building targeted material to market to particular groups. We are sending out call-to-actions for offers to certain groups of people who we know would be interested, and if they choose to click through and download this, they are automatically sent to a thank you page that shows them other offers they might be interested in as well. Conversation builds relationships, it’s a fact. By taking advantage of the interactive capability of social media you can engage your followers, get instant feedback and build these relationships that could turn a potential lead into a sale. Ask questions, respond to comments and encourage likes and shares with incentives. With all the social media networks out there we are sure you can find one that suits your brand persona. Test several, do some research and figure out where your target persona is hanging out. And remember this: according to Marketo 94% of people consider how helpful your post would be for a friend before they repost it, so make sure you are putting out relevant, quality content. 4. Snackable content worth stopping for. Snackable content is a quick bite that is worth stopping at and worth sharing. Not only does it have to be eye catching, like a graphic or a catchy headline, but also it has to have quality content. It has to embody the saying big things come in small packages. There is a lot of this content out there so it’s more important than ever to really make yours stand out among the competitors. And at the same time, don’t shy away from sharing some of this snackable content that’s already out there even if it’s not yours. By sharing relevant, credible content from other sources you are building trust with your readers and displaying yourself as an expert in your field. After all why would you bother following 10 different inbound marketers on Facebook when you could just follow one and let them weed through the content for you? With the rise of mobile browsing it is more important than ever to catch a potential lead’s attention instantly and with snackable content you can achieve this without taking up to much of their time or giving them more than they were looking for right away. 5. The rise of micro-video. This newest, wildly popular social media trend cannot be ignored. It all began 2013 with the launch of Vine, a mobile focused micro-video messaging service that allows users to share 6 sections of video. Instagram soon followed suit and introduced a feature that allows their users to upload and share 15 seconds of video. And while these companies are not the only ones jumping on the micro-video trend, they are the most popular so far. Vine, for example, has seen a 40% user growth sense its launch in 2013. That’s huge! Focus on quick shots rather than polished. Most videos are coming from mobile devices so leave the tripod at home and think about the quality of content instead of getting a Hollywood ready shot. Make your brand clear from the start. We are only talking about 6-15 seconds of video here so introduce your brand immediately. Did you enjoy today’s post? Share with us in a comment below and let us know what you’re eager to start trying!